When I became Mom’s caregiver, I knew instinctively there were going to be decisions that I would have to make for her. When and how to sell her condo and car. Which of her household items would come to my house, or be sold/donated, or gifted to family. Closing her credit cards. Stuff like that was obvious because Mom just wouldn’t be able to make those big decisions. But it’s the little daily decisions that she can’t make that have really surprised me. Turns out, indecisiveness is not uncommon in people who suffer from dementia, and is sometimes even an early warning sign. It is most apparent when we eat at a restaurant or go to the nail salon. Mom takes absolutely forever to decide what she wants off a menu or what color to paint her nails. It can be frustrating for wait-staff, others of us at the table with her, and the lady who wants to choose her gel color but can’t pry the color wheels out of Mom’s hands. But it does make sense. Think about how you review a menu and decide what to order. It likely goes something like this. For Mom, it’s like this. Mom’s brain just reboots so often that she literally cannot remember what she read or looked at seconds ago. So she’s seeing every item on the menu for the first time and can’t process a decision. If, by chance, she says, “Ok, I know what I want.” I pounce. She tells me. I remember. I help her place her order when the server comes over. I know I’ve said this before, but I’ll say it again. Too many choices are just downright cruel for someone who suffers from dementia. But appearing to always make up their minds for them can be just as demoralizing. It makes people in Mom’s position feel as though they are no longer in control of their own lives. So, I never just make the choice for her. She has to feel as if she did it all on her own. And that takes patience and a bit of creativity, at times. No. No you can’t. She needs to make a decision now or never. I’m so glad you are willing to take these steps to stay engaged as well as sane in this situation. Much better than I can even with my dad. Definite inspiration. Also, dementia can swing the other way, where they want to go to the same safe restaurant and get the same safe meal to choose every time. 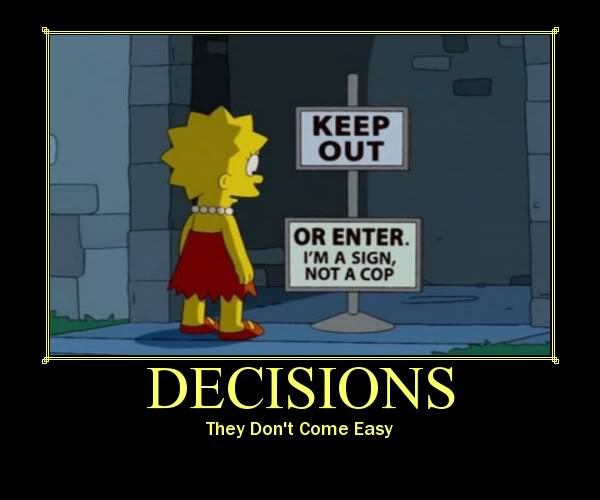 Therefore no decisions,. I got bored with the same restaurant, but it made my Dad happy. In retrospect, it probably saved me a lot of frustration. You may want to try the same restaurant every time.